What is the treatment for fractured teeth or broken teeth? Teeth can fracture or break due to impact during accidents. Treatments vary depending on severity of damage to tooth structure. 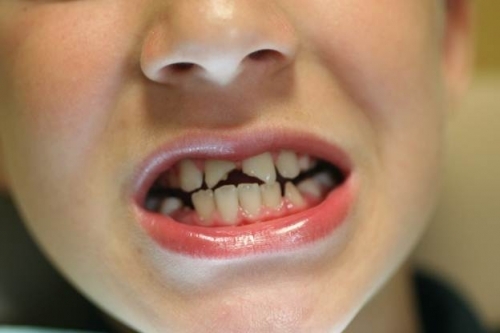 Minimal damage : Tooth fracture involving only the outer enamel layer or part of Dentine which is the second layer of tooth can usually be filled with tooth colored filling materials called composites. Extensive damage: If the pulp is affected in the fractured teeth, then Root canal treatment is required for the affected tooth to avoid pain and infection of pulp. Later, the tooth should be covered with dental crown or cap. What is the treatment for teeth fractured or tooth broken at the level of gums? 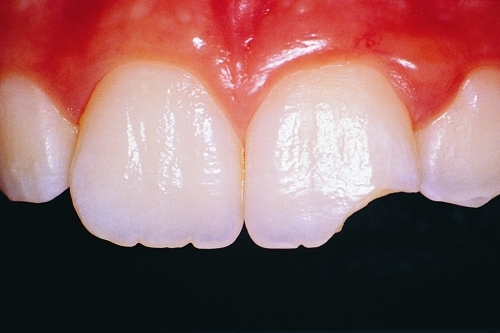 Tooth fracture or tooth broken at the level of gums leads to extensive loss of tooth structure. In such a situation, it is necessary to build up lost tooth structure and then dental crown can be seated over the tooth. This can be done with the help of Post and Core restorations. Post and Core restorations include two components. 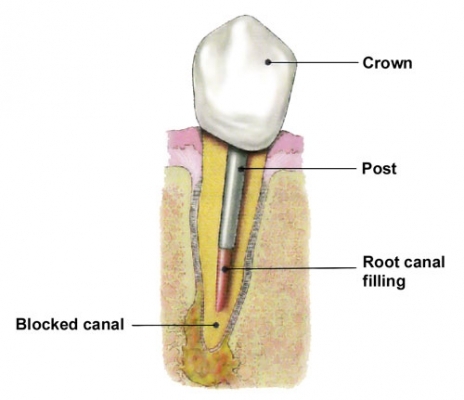 Post extends into the tooth root and core makes up for the tooth crown. 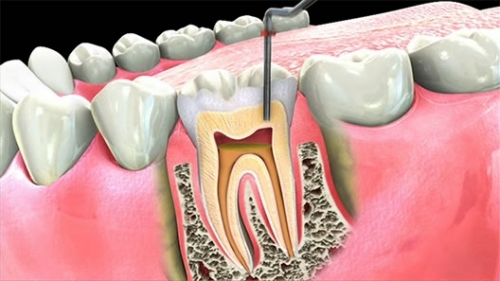 To begin with, the tooth should be treated with Root Canal Treatment. Later, root canals are prepared to receive the post. Either Pre-fabricated or Cast posts are used. Once the post is seated in the canal, core is built up with strong restorative materials. This core acts as the tooth structure on which dental crown can be seated. Thus Post and Core procedure helps in saving the broken tooth. Root Canal Treatment is the treatment procedure to remove the infected blood vessel & nerve from the infected tooth to render it infection free& to relieve the pain. The affected tooth is anesthetized. Tooth is drilled, to reach pulp chamber and to have access to blood vessels and nerve of the pulp chamber and root canals. Fine instruments are used to reach the root canals and to clear the root canals of infected tissue. These are called files and are available in various dimensions. Files of suitable sizes are used for mechanical cleaning and shaping of the canals. 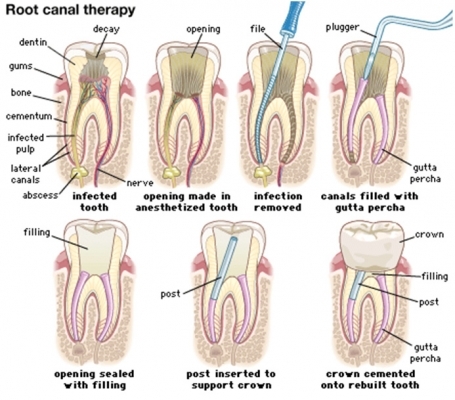 Irrigating solutions are also used during Root Canal Treatment procedure. They help in dissolving and flushing out the tissue and toxins of organisms. These solutions aid in chemical cleaning of the canals. Thus at the end of the Root Canal Treatment procedure, it is ensured that the tooth is free from any infection and the abscess if any has been completely drained out. 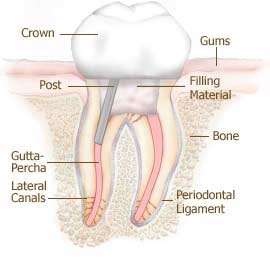 Now the tooth is filled with materials called gutta-percha which are specifically designed to fill root canals. This filling denies entry of microorganisms into the root canals and bone around the tooth in future.